Congratulations!! You’ve just bought a sharp, new set of wheels for your vehicle and that “just like new look” is exactly what you hoped for. But without proper care, that look won’t last forever. Your wheels can be the dirtiest part of your vehicle. Constant exposure to the elements as well as corrosive brake dust, dirt, tar, ocean and road salts can cause damage to the finish on your wheels and it is important to clean them often and properly. Here are a few tips to keep your wheels looking good. Buff on a coat of wax, or specially made wheel paint sealer upon installation and after washing to protect and prevent dirt and/or brake dust from easily sticking and bonding with the wheels finish. Wash your wheels with a mild soap and water solution. 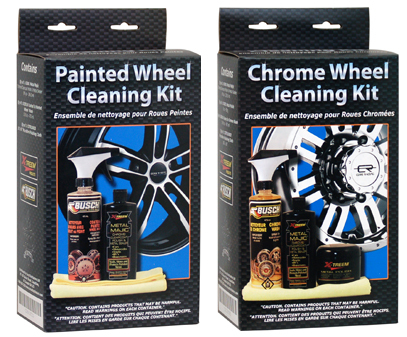 Harsh cleaners can easily strip away the clearcoat, or cause staining to the wheel. Never wash a wheel while it is hot. Try cooling them with cold water first. Stay away from automatic car washes, they may use harsh cleaners or stiff brushes that can easily scratch or damage your wheel. Wash one wheel at a time so that soap doesn’t dry and bond to the finish.